Brown paper bags are one of the most frequently used methods of packaging goods. 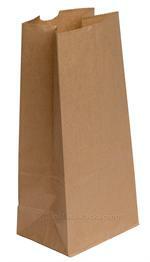 These paper bags are cost effective to buy making them economical for your business. As they are 100% food safe they are more commonly used for holding fruit, vegetables, sandwiches, confectionery, gifts and rolls. There are however many other uses for these brown paper bags such as greeting cards, gift shops and bakers. They are also useful for drying herbs or used at playtime with the children to make hand puppets.